Another week has come and gone and we are one week closer to Spring!!! Yeay! The days are getting longer and the sun is beginning to shine more. I actually did some upholstering in my garage last week with the door open and no coat on! WOW! Can’t wait for more of those kind of days! This week’s features are true knock outs once again! Thank you to all who faithfully join in and welcome to all who are new! 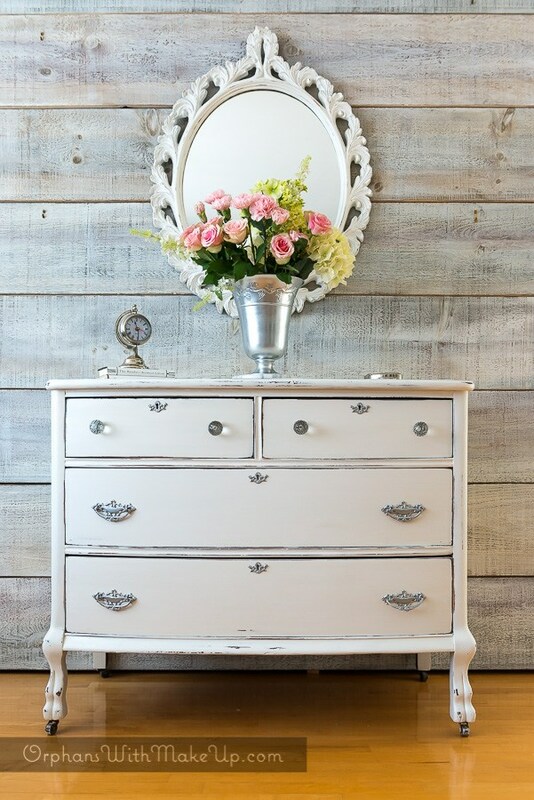 Mary from Orphans With Makeup Shared this beautiful Pearlescent chest of drawers. The hardware and the finish on this piece are absolutely gorgeous! You must go check out her work, she does amazing things with paint! 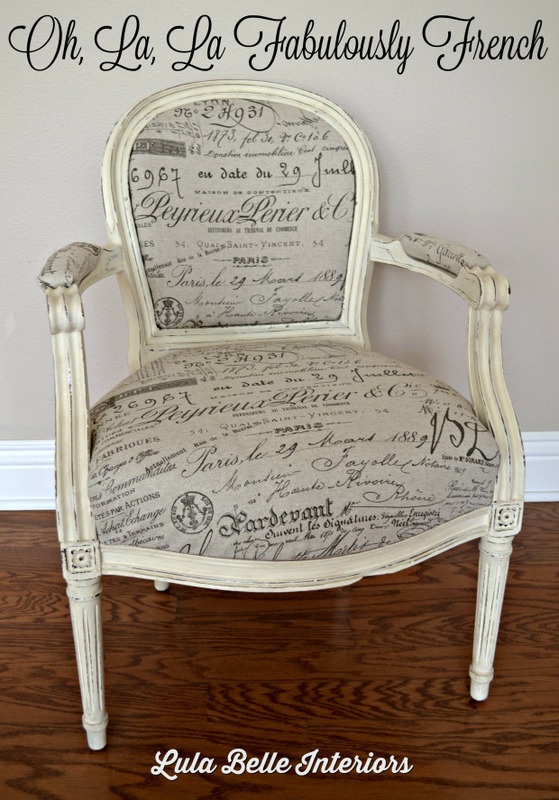 Lula Belle Interiors shared this beautiful French Chair. I love the choices for fabric and finish and the contrasting plaid fabric on the back finishes it off perfectly! Well done! You should really see how this chair started out … What an update! 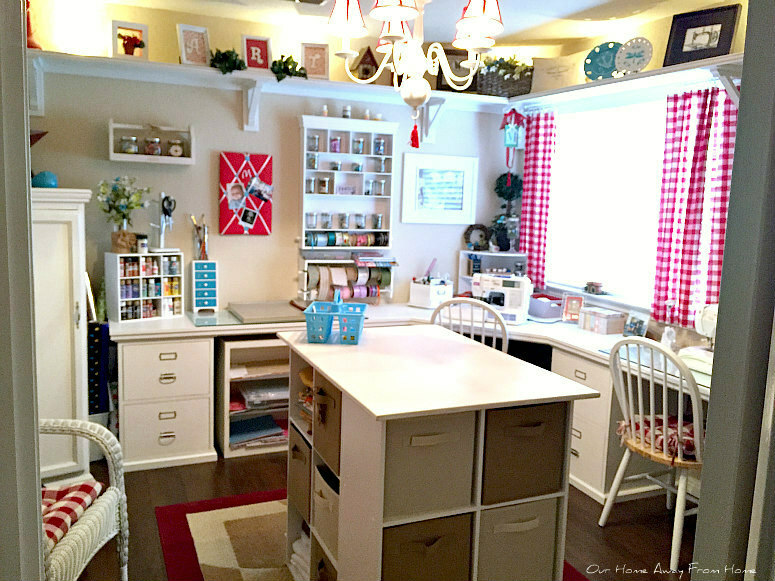 Maria from Our Home Away From Home shared her INCREDIBLE craft room! I am soooooo drooling over this space! Oh the amazing things that could come out of a room like this! It is every crafter’s dream! You absolutely must pop over and visit all the details of this fabulous room! Craft room envy! 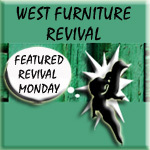 …..
Lynn from Nourish and Nestle shared this roadside rescued side table. She really brought this little stand back to life with it’s new outfit in gold and black! Go check out the before pictures and see all the hard work put into this piece! If you would like to view last week’s party you can do so by clicking here! Enjoy the following eye candy and don’t forget to check back to see all who linked up after you! Feel free to link up as many of your previous or present projects as you would like! The more inspiration the better! 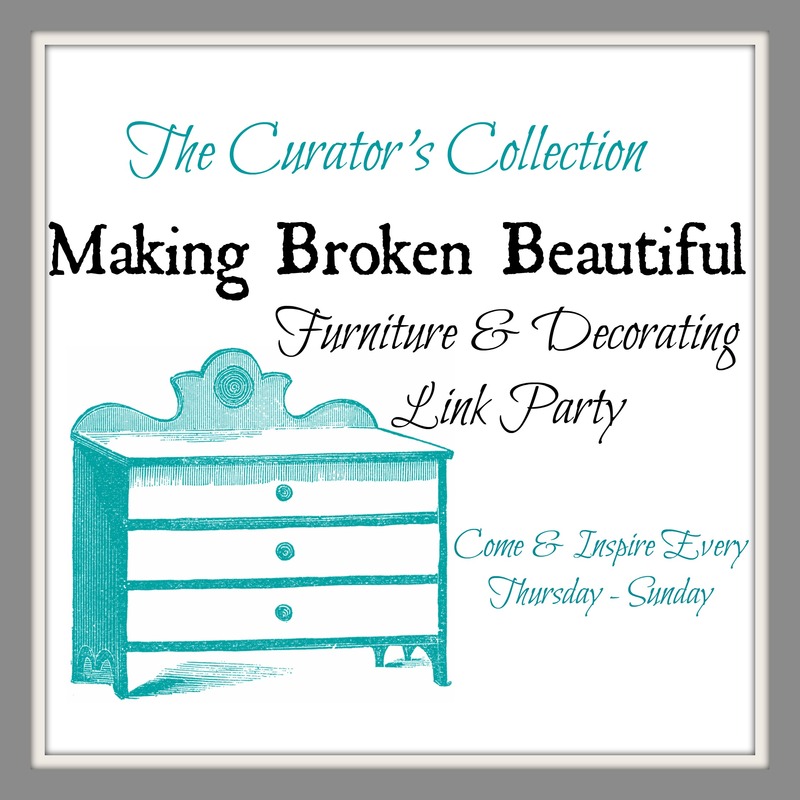 Please post a permalink (the link to the furniture you are sharing) not the link to your blog. Your entry must also be linked back to this party. If you are linking up things that are not furniture or design related they will be deleted …. sorry! This party will be open to join every Thursday 6:00 am MST and closes on Sunday evening 6:00pm MST I will choose a few pieces to showcase each week and share my choices with you the following week. Please visit/leave a comment to at least two links before OR after your own! Thank you Maxine! You as well! Thanks for your kind comments on my vintage suitcase & luggage rack set. 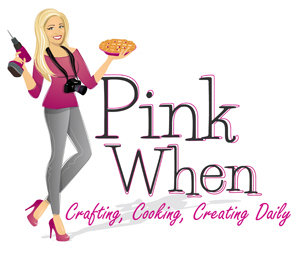 I’m sharing it here, and look forward to visiting your blog often! Thank you so much for joining in! I hope you have a great day! Thank you for taking the time to join in! I hope you have a great weekend as well! So many beautiful projects, but the office storage resonates with me right now (my office is a disaster). Love your blogs! Thanks for the feature and for another link party. We are supposed to be getting some Spring weather next week and hopefully I can open work with the garage doors open too! Have a great weekend Terry. You are so welcome Mary! I couldn’t help but share that gorgeous piece of eye candy! Well done! Thank you again for the invite. I have had a great time checking out your home and furniture fix ups. Have a great weekend. I’m so happy you are here Alaina! You do lovely work! I hope you have a great week! Love your chocolate inspired table Marie!!! Thank you so much for sharing your inspiration! I hope you have a great week! So many talented, creative people! Amazing!